The Monroe Inn has had a long history of ghost sightings. These hauntings date back to a shipwreck that happened within sight of the inn over a hundred years ago. The spirits have haunted the staff and guests of the inn ever since, and it has always been good for business... until now. Something has caused the spirits to act up and to lash out at the guests. The foundation for Paranormal Investigation has been called in the investigate what may be their most chilling case yet! 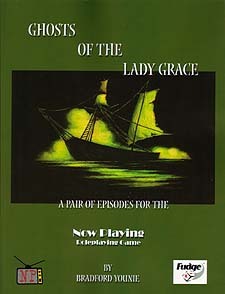 Ghosts of the Lady Grace is a pair of horror adventures made for the FPI mini-setting that comes with the Now Playing roleplaying game. The players get to investigate the mystery like real-life ghost hunters. But unlike the ghost hunters on TV, your players will be in for more trouble than they imagined! This game is made for use the Now Playing, but it can be played with the normal Fudge rules. As an added bonus, Ghosts of the Lady Grace comes with a special chapter called "Ghost Hunting 101," which introduces you and the players to the procedure and tech of investigating haunted houses.